Tea tree oil is obtained from the leaves of the Melaleuca plant. It's often credited as being a natural treatment for acne. Although a few small studies shows that tea tree oil may have some acne-fighting abilities, the true effect tea tree oil has on acne is unclear. And, as with conventional acne treatments, tea tree oil can cause side effects of its own and should be used with care. If you're at all interested in aromatherapy, alternative medicine, or even naturally-based personal care products, you're probably familiar with tea tree oil. It's a common and inexpensive essential oil, and is a frequent addition to skin care and hair care products. Tea tree oil is obtained from the leaves of the Melaleuca alternifolia plant, a woody shrub that's native to Australia. Its oil is thin, clear to yellow in color, with a striking camphorous, medicinal odor. It's sometimes called melaleuca oil, or ti tree oil. Historically, tea tree oil has been used for skin infections, fungal infections (such as athlete's foot), ulcerations and other wounds. Today, it's also a common ingredient in soaps, body washes, bath products, and shampoos. Tea tree has been shown to have antimicrobial properties, which is probably why it is a popular natural remedy for treating acne. It's believed that tea tree helps kill Propioni acnes bacteria, which are responsible for acne breakouts. Unfortunately, only a few small studies have been done, so the actual effect tea tree oil has on acne is still unclear. One older study, comparing tea tree oil with benzoyl peroxide, found tea tree improved both inflamed and non-inflamed acne breakouts. It wasn't quite as effective as benzoyl peroxide, and it did take longer to see improvement. But tea tree didn't cause as much dryness, peeling, and flaking as the benzoyl peroxide did. A more recent study found 5% tea tree oil improved acne when compared to a placebo. Although the results of both studies seem promising, much more research needs to be done before tea tree oil can be listed as a proven acne treatment. As exciting as some of the initial information may seem, tea tree oil isn't a magic cure for acne. It's biggest drawback is that it's simply not as effective as some of the other acne treatment medications available today. Although tea tree oil shows promise as an antimicrobial, acne isn't caused solely by bacteria. There are many factors that cause acne breakouts. One is the abnormal desquamation process that occurs in acne-prone skin. Another is the over-active sebaceous glands. Tea tree oil doesn't to anything to treat these factors. Also remember that natural treatments aren't completely benign. Tea tree oil can cause side effects of its own. Tea tree oil can irritate the skin, especially the delicate skin on the face. For some people it can cause contact dermatitis, a raised, itchy rash. You can develop a sensitivity to tea tree oil over time. Tea tree oil isn't the most effective acne treatment available. But if you're committed to using only natural treatments on your skin, tea tree oil is probably your best choice for a natural, alternative acne treatment remedy. 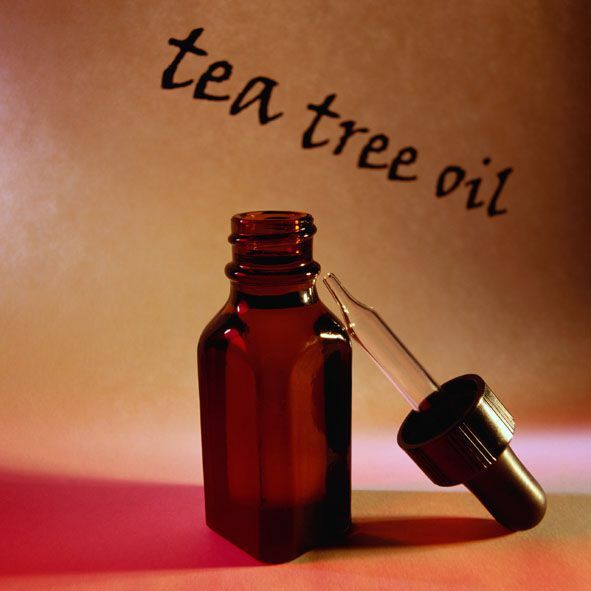 Tea tree essential oil can be purchased at any natural food store, but should be diluted before applying to the skin. Most aromatherapist recommend diluting tea tree oil in a carrier like coconut oil or sweet almond oil. But beware, these oils can clog your pores and make acne worse. You may decide it's easier to purchase a skin care product that contains tea tree oil, instead. If you go this routine, read the ingredient listing and choose one that has tea tree oil as the active ingredient. Tea tree products are probably best used as spot treatments for the occasional pimple, rather than as a sole treatment for the prevention of acne. Bottom line: More studies need to be done on the effects tea tree oil has on acne. Proven acne treatments are still your best option, not only because they have a well-studied track record but because they treat all of the different acne-causing triggers, not just bacteria. If you have more than just the occasional blemish, and your acne is persistent, tea tree oil simple isn't the most effective option. You'll be better off using a proven OTC acne product like benzoyl peroxide, or getting a prescription medication from your dermatologist. This is especially true for stubborn or severe acne. Already using prescription acne treatments? Make sure you ask your doctor before you incorporate tea tree oil products into your routine. Bassett IB, Pannowitz DL, Barnetson RS. "A Comparative Study of Tea-tree Oil Versus Benzoyl Peroxide in the Treatment of Acne." Med J Aust. (1990) 153 (8): 455-458. Enshaieh S, Jooya A, Siadat AH, Iraji F. "The Efficacy of 5% Topical Tea Tree Oil Gel in Mild to Moderate Acne Vulgaris: A Randomized, Double- Blind Placebo-Controlled Study." Indian Journal of Dermatology, Venereology, and Leprology. 2007; 73 (1): 22-5. "Tea tree oil (Melaleuca alternifolia [Maiden & Betche] Cheel)" Medline Plus. 01 Feb 2008. National Institutes of Health. Can Tea Tree Oil Help Zap Pimples? Will Washing Your Face with Antibacterial Hand Soap Clear Acne? Is Doxycycline Right for Your Acne?